I have this thing about grey. It's a color I both can't stand and absolutely adore. Let me clarify. After living in Boston for the last year where waking up to a grey day is a likely occurrence about 280 out of 365 days a year, I developed a healthy aversion to the dull hue....but only when it comes to weather. Give me a buttery soft bag in grey leather, a shimmering pair of gunmetal trousers, or some antique-looking mercury glass knobs and I am happy as a clam. I love to wear and decorate with grey - it goes with everything, and provides a perfect background for bright pops of color (like yellow!). Such awesome picks! 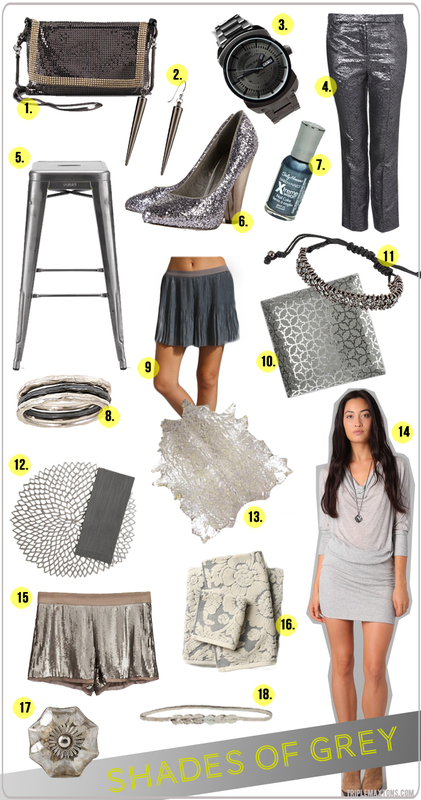 I'm so all about gray in every shade, texture and finish. Loving the heels, tray, rug and shorts!